Reliable detection of weld defects is a challenge in many industries that use welding on a large scale, such as the oil and gas and petrochemical industry. Dissimilar weld materials and stainless steel welds are even more difficult to inspect. Lack-of-fusion defects in particular are sometimes hard to detect. The current gold standard in nondestructive testing of welds is radiography. However, there are safety concerns about the harmful X-rays used in radiography – as well as limitations to its use in inspection. With the right setup, ultrasonic inspection can address these limitations, as it uses soundwaves rather than ionizing radiation to detect defects quickly, reliably, safely and without interruption of work. Welding is carried out on large scales in many industries. Defects can occur in a weld, either due to incorrect operation of the equipment or due to an incorrect welding setup. Examples of common weld defects are porosity, lack of fusion, slag inclusions, root or toe cracks, and incomplete penetration (figure 1). Defects can have a significant impact on the strength of a weld and therefore on the quality of the component. The most reliable and cost-effective way to ensure the quality of welding on large scales is by nondestructive testing (NDT). Depending on the weld material and its preparation, certain types of defects can be either easy or difficult to detect. Lack of fusion (figure 2) can occur, for example when a bead of molten weld material fails to melt the parent material and simply solidifies on top of it. The resulting bond has a low strength. This means that lack of fusion is one of the critical flaws that need to be detected. There are many types of defects that have a negative impact on weld strength. Radiography as the current gold standard relies on high-energy photons traveling through metal towards a detector on the other side. Any irregularities inside the component – either in the weld, the parent material or at the interface – show up as brighter or darker regions on the detector. The main limitation of the use of radiography is the harmful effect of the radiation used. Due to the many risks to human health caused by high-energy X-rays, safeguards are needed to avoid exposure to radiation. This usually means that a large area in the direct vicinity of the inspection has to be evacuated, disrupting the work in the area of inspection. Probability of detection is likely to be a factor when choosing a method for weld inspections. There is evidence1 that the contrast of defects such as lack of fusion can be low when using radiography. This means that the probability of detection of these defects in stainless steel or dissimilar-material welds is reduced. Molten metal can solidify without bonding with the underlying material. Another key drawback of radiographic inspection is the time it takes to inspect a component. In some cases, long exposures lead to increased inspection times and therefore lengthy disruptions to work in the area. When long X-ray exposure times are required, switching to faster methods can lead to cost savings in different ways: time spent by the inspector and minimal disruption. An alternative technique for inspecting welds in search of defects is ultrasonic inspection. Ultrasonic flaw detectors, such as Olympus’ OmniScan MX2 (figure 3) use sound waves rather than radiation to inspect components. Detection is based on the deflection of these sound waves at interfaces within the component. 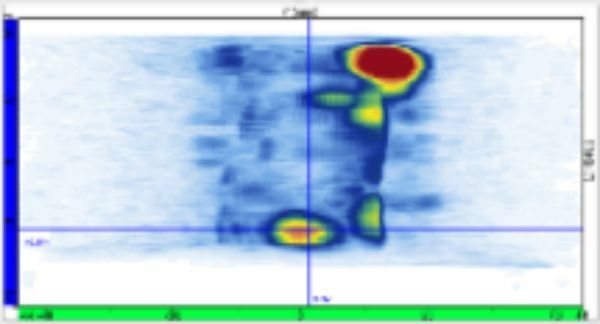 To maximize probability of detection – and to enable imaging and sectorial scans – ultrasonic phased array probes can be used. Ultrasonic transducers work by detection of high-frequency sound waves, either by the emitting transducer itself (pulse–echo technique) or by a receiving transducer (pitch–catch technique). In difficult components, such as stainless steel or dissimilarmaterial welds, high levels of noise are generated. In these situations, the pitch–catch technique, also known as the transmit– receive longitudinal technique (TRL), is preferable (figure 4). Ultrasonic flaw detectors such as OmniScan are compatible with a large range of probes for different types of inspection. Pitch–catch inspection can be carried out using either conventional, single-element probes or using phased array probes where each transducer contains multiple elements; these probes are known as dual matrix array (DMA) probes (figure 5). In phased array inspections a flaw detector controls each element individually. 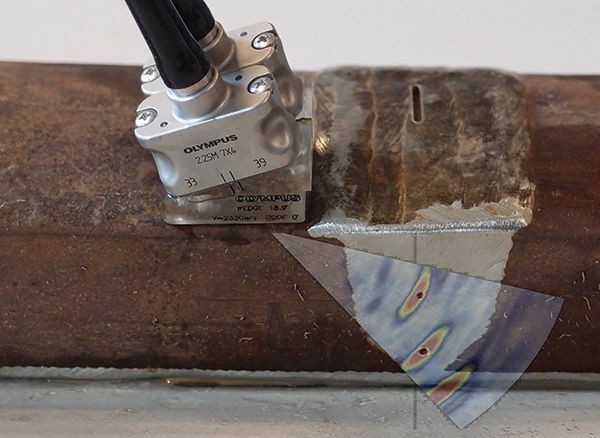 Among the benefits of phased array are imaging capabilities, sectorial scans and easy coverage of a weld without moving the probe back and forth. These capabilities, combined with better control over the ultrasonic beam, simplify inspection for improved probability of detection. Noise levels can be reduced by using separate emitting and receiving probes. A DMA probe containing two transducers with 28 elements each combines the benefits of phased array inspection with those of the pitch–catch technique. Ultrasound inspection offers important benefits over radiography, particularly with difficult types of weld materials; it does not require ionizing radiation, thereby improving safety and avoiding work interruptions. It can also make inspection faster and offer higher probability of detection of certain hard-to-see defects. These benefits make ultrasonic inspection equipment, such as Olympus’ OmniScan MX2 phased array flaw detector, highly suitable for large-scale weld inspections that have to be done quickly, safely and with a high probability of detection. More information can be found in the comprehensive white paper at www.olympus-ims.com/en/easy-ultrasonic-phased-array-inspection-ofcorrosion- resistant-alloys-and-dissimilar-weld-materials/. This white paper gives advice on the different parameters to consider for setting up ultrasonic inspection correctly for the best possible inspection results.